Net Promoter Score (NPS) is one of the most helpful tools available for measuring the temperature of your customers. Lots of businesses use NPS as a tool to make decisions because it tells them what they have to do to keep customers coming back and referring other people. At its core, NPS measures customer satisfaction and collects feedback. The survey consists of one question that asks customers how likely they are to recommend a brand, product or service. Based on the responses, customers are split into three groups. Detractors (0-6) are people who aren't happy with your product or service. They're more likely to share negative reviews and, with the widespread use of social media, this can damage how others perceive your product. Passives (7-8) are neutral to your product or service — they don't hate it, but they're not in a rush to recommend it to other people. Because they're neutral, they're the most at risk of leaving and switching to another brand. Promoters (9-10) are the gold standard. These customers are happy with everything you do so they're loyal. They're willing to refer you to their friends and family. It offers qualitative and quantitative feedback. People appreciate a short survey so they're more willing to answer the question. The score is simple to calculate. You calculate NPS by subtracting the percentage of promoters from the percentage of detractors. What you're left with is a score that ranges from -100 to +100, which tells you how satisfied customers are and how likely they are to refer you. A good score is +50. But not everyone sees NPS as a solid metric to base business decisions on. Of course, NPS isn't the only metric to use if you want to understand your customers, it just gets the ball rolling. NPS is a basic calculation that some worry doesn't give any valuable, actionable insight. It doesn't give a true indication of what customers are going to do and therefore doesn't influence growth. As one critic points out, NPS doesn't ask customers about their current behaviors. Instead it asks them to predict some future action that may or may not happen. Despite the naysayers, there are lots of situations where NPS is an effective tool. Instead of using it without a plan for customer followup, use it to measure the temperature of your customer groups and figure out a way to interact with customers based on their responses. When should you use NPS and when should you not? NPS has its benefits but it isn't a blanket metric to use to make all of your decisions. It's just one piece of the puzzle. That's why knowing when to use it is so important because it doesn't apply in every situation. Don't use NPS when you want an accurate yardstick of how many people like your product and how many people don't. Many NPS tools don't segment customers for you; all responses are lumped together. This is especially troublesome because NPS varies wildly for the same customer. This leaves you with a long list of numbers with no real insight into what's driving the responses. One day a customer might be at a nine or 10 and another day they're at a five or six. Let's say they're a subscription customer, and their monthly payments are the same. So if scores change even when payments don't, NPS isn't correlated to purchases. And if there's no correlation, we can't say that the score is indicative of the level of customer loyalty.Also, don't use NPS when you don't have a specific cohort of users in mind or that cohort is not big enough for statistical significance. The responses won't mean much and basing decisions on them can hurt your product. You collect a lot of customer data — their preferences, their location, their buying habits and more. Use this information to your advantage and segment customers into groups. For example, if customers are grouped by their buying habits you can use this to target specific groups with NPS. This way you're not sending email blasts asking the same people the same question repeatedly. Stagger your survey and analyze each group separately. For people who buy frequently or have a more comprehensive subscription package, use an in-app survey while they're in your app using it. With this approach, customers are more likely to respond and give honest and thoughtful feedback. Consider setting it up to only trigger for certain customer groups at a time. For example, when they log into their account, confirm their group and then show the survey. You can also use NPS across the customer journey. From onboarding to activation to retention, NPS will help you guide your customers through the process. Customer onboarding is a huge part of what makes your product successful and determines whether or not customers will stay or go. Get onboarding right early on, and you have a better chance of retaining more customers over time. 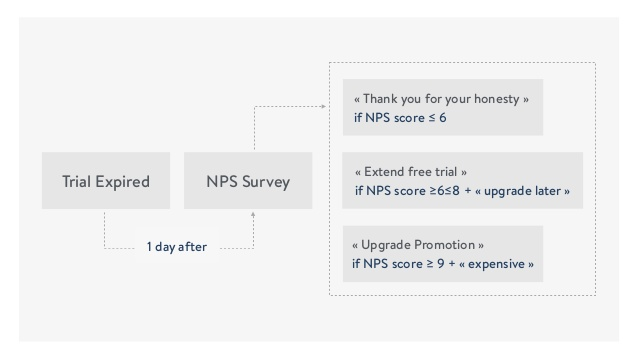 You can use NPS to figure out what separates the customers who cancel from those who upgrade and make an impact on your conversion rate. Run a survey immediately after the end of a customer's trial period and ask the ones who churn how they felt about the service. Depending on the bucket they fall into, you can take a number of actions. Here's how Mention approached this situation and increased their conversion rate. Promoters got a discount as encouragement to upgrade to a paid plan. Passives received an extension to their free trial. Detractors got a thank you email. The best chance Mention had to retain customers was to offer specific value to passives and promoters. These groups were more likely to be receptive to a little extra effort and attention to convert and buy. NPS worked in this scenario because Mention knew which customers to target and offered each group value. In the end, customers got a meaningful experience out of it and could probably say that it was somewhat of a turning point for them. These customers could have walked away but the extra effort on Mention's part kept them engaged. Customers were encouraged to buy a package and, by doing so, Mention got a revenue boost. Activation is the second most important part of a customer's journey. This is your chance to make sure that their first few days using your product are their best. Activation affects your growth potential further down the funnel because the sooner a customer understands and appreciates what you offer, the longer they'll stay a customer. NPS is a great tool to help move customers to activation. If you compare your NPS survey responses with customers' actual behavior in your product, you can start to understand what behaviors separate your promoters from your detractors. The takeaway here is that when you find your product's “aha moment” — the point where customers experience the promised value for the first time — you know when activation happens. So instead of focusing on detractors and trying to turn them into promoters, focus instead on getting promoters to the aha moment. Look at all the major actions customers can take in your product — upload content, add to their contact list, write a review — and compare whether these actions correlate to NPS. For example, let's compare two customers. One uploads content within a few days of using your product and the other one doesn't do anything. Send them both an NPS survey to see if the customer who uploaded content has a higher score. If it's higher, send NPS surveys to a larger sample and if results show that uploading content always equals a higher NPS score, you've found a correlation. Now the focus is making sure that you can get as many customers as possible to upload content. In order to drive retention, reach out to customers based on their response. I'm not talking about their score; this is just the first step in the conversation. What I'm referring to is the conversation you have with customers after the NPS survey. Even though the survey takes a few seconds for a customer to complete, take a moment to tell them that their input is valuable to you and it's all part of making the product better. Getting feedback is especially important if you've uncovered serious issues. Follow-up gives you a chance to connect with customers to improve the relationship and retention. The goal here is to use the qualitative data you collect to not only improve your product and retention but also to cater your communication to the needs of each NPS group. NPS is a very helpful tool; you just have to be clear on when to use it to get the most out of it. This way, the information you get is meaningful and offers real insights you can work with. Plus, it's not all about the number you get when you run the calculation. It's more about how you take that information to cater to the specific needs of each customer.